There’re so many different people out there with an opinion. Not many of those opinions carry much weight. But there’s a reason a handful of people predict the entire Final Four group correctly. They are lucky. No one knows what to expect and this year is perhaps the most open year in the history of college basketball. The four #1 seeds that make up this year’s tourney are all pretty accomplished, but only three of them were really expected to be in the conversation for a seed this year. Oregon is obviously the surprise in this slot. The Pac-12 was deeper than most people will give it credit for, but there really were no teams that were anything other than good. Oregon should’ve been a fringe #2 but somehow made their run in the last few weeks from outside the Top 15 (after a surprising losing streak). Perhaps Virginia was a surprise at the 1-slot as well. They didn’t win their conference and Michigan State was a team that many had already penciled in to win a few rounds at the very least. 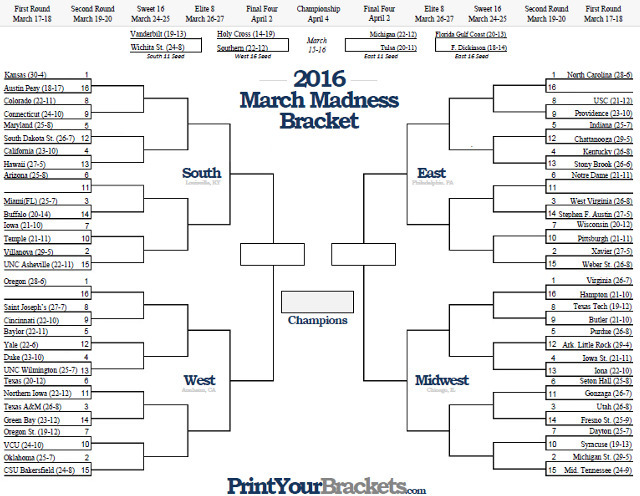 But the Spartans got a 2-seed and was thrown into the exact same bracket. Luckily for them, the rest of the Midwest isn’t a stacked region. Look for teams like Purdue or Iowa State to make a push. Both were Preseason Top 10 teams and both present tricky matchups for many outside the region. Is it just me, or is Duke seeded way too high? Regardless, Oklahoma is the best team in the West bracket. The Sooners are best than Oregon and better than Texas A & M. None of these teams scare me. If Buddy Hield shows up then it will be tough for anyone to do much. Don’t count out Mike Krzyzewski and the Blue Devils, but that’s looking like an Elite Eight matchup with scores in the high 80s or low 90s. Let’s keep looking around. Kansas has the top overall #1 seed as the best in the South. Villanova was a 1 before they lost to Seton Hall, but they still probably had a better season than Oregon and had done quite well in recent weeks. They will still be legit. As will several other teams with the ability to turn it on including Iowa (who has fallen flat the last 3 weeks), Miami (who has a very athletic, crafty group of guys that can score in a variety of ways who are also experienced), and Maryland (who was a Preseason #1 in many peoples’ eyes. The curious seeding here was also the 4. How did California get here? Did ESPN have something to do with it? The Golden Bears have been even more overhyped than Maryland. They’ve got a handful of guys with NBA talent and they are a mediocre college team. Also, UConn ran the table and won their conference tournament. Sound familiar? And finally, we look at the East with UNC as the #1. Tricky teams like Providence, Notre Dame, and Wisconsin are around to mess up brackets. And then there’s an improving Kentucky, an efficient Indiana, and a West Virginia team that makes life hell for their opponents. Xavier is a 2 seed and they might be better than we think. This is all in one region! How? Doesn’t make tons of sense. This is why they call it March Madness. Totally. It’s so wide open. And yet for some reason the UNC bracket looks the toughest. They weren’t even the lowest rated #1. Doesn’t make tons of sense. But it happens. Lots of questionable decision making but it’s the NCAA we are talking about and they never make sense.